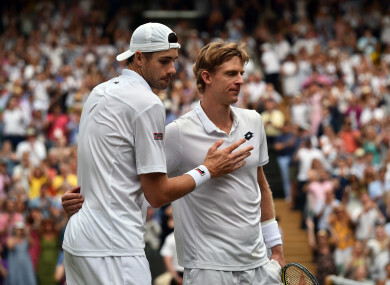 Isner and Anderson after last year's semi-final. WIMBLEDON WILL INTRODUCE tie-breaks in the final set of all events for the first time next year, but only once the score in the deciding set reaches 12-12, the All England Lawn Tennis Club announced today. While we know the instances of matches extending deep into the final set are rare, we feel that a tie-break at 12-12 strikes an equitable balance between allowing players ample opportunity to complete the match to advantage, while also providing certainty that the match will reach a conclusion in an acceptable timeframe,” added Brook. Email “Wimbledon introduce final set tie-breaks following longest-ever semi-final ”. Feedback on “Wimbledon introduce final set tie-breaks following longest-ever semi-final ”.